Sharing https://www.kaiserex.com cryptocurrency exchange updates we developed this winter. Enjoy client support which is quick and really helpful. Comparing to a historical example of a smartphone. Smartphone was invented in 1992. A reasonably good smartphone was built in 2005 and it captured ~2% of mobile phone market, 7 years later it was 54% and it took 11 years to capture 81%. No one doubts that a smartphone is an extremely useful gadget to have, just as bitcoin is an amazing tool for storing value and transacting. Bitcoin shouldn’t take that long, because overall pace of technology development is getting faster, but it will still take years to reach mass adoption. We are one of the most liquid exchanges on the market trading on 37 different cryptocurrency exchanges worldwide with automated trading bots. 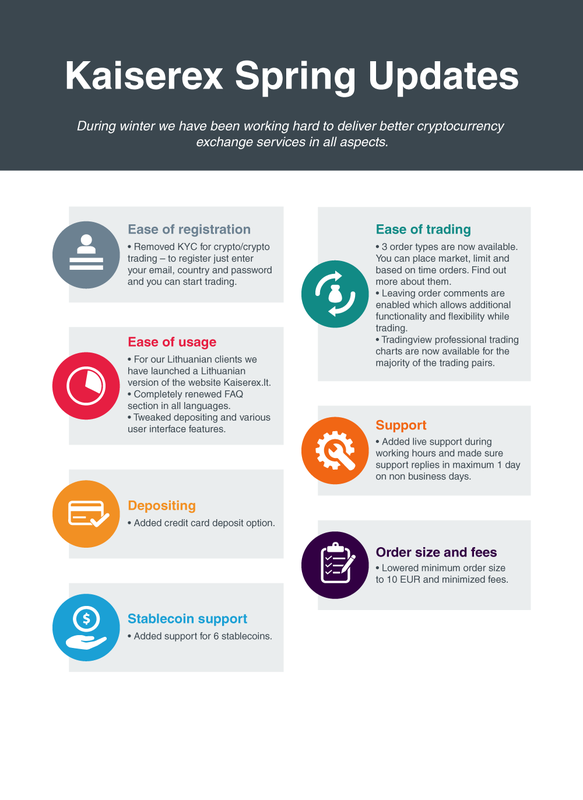 We offer to buy/sell cryptocurrencies on your behalf and provide the most competitive rates possible. We have very unique ordering features, such as order execution time and price change toleration, which allows our trade desk to use Technical Analysis and choose statistically more profitable entry/exit points for our clients. We have live email support during working hours GMT +2. You can be sure to receive same day and usually faster replies. As a premium exchange we execute custom orders for clients, with various custom requests and issue credit lines if needed. You can find out more about it https://www.kaiserex.com/how-we-secure-your-assets/ . In general, we recommend our users to buy a hardware wallet and hold it on their own. Minimum order is 10 EUR, minimum fee is 3 EUR, depending on volume fee ranges from 0.18% to 1% or 10 EUR. Before making any exchanges we highly recommend to read all the information provided on www.kaiserex.com . It will help to understand what are the risks and what are the responsibilities of the exchange. We do want our clients to be fully aware of this before starting to use our services. Payments: SEPA EUR payments and swift payments in EUR, USD, GBP. JPY. Cryptocurrencies: BTC, ARK, BNB, BCH, BTG, GBYTE, DCR, ENG, ETH, ETC, FCT, KMD, KNC, LTC, MAID, XMR, NEO, XEM, QTUM, XRP, XLM, WAVES, ZEC. If you do have some questions, please comment on this thread, private message me or leave your message on our platform. I am looking forward to all your questions, recommendations or opinions.